One rule I came to late in life: You cannot judge good direct marketing; it judges you. In other words, good direct marketing does what it was designed to do. It doesn’t matter if you hate it/don’t understand it/are horrified by it. If it works, it’s good. And it’s your job (and my job) to analyze it and figure out why it worked. And then steal smart. Denny’s words serve as an effective disclaimer for the campaign critiques that occasionally appear on this blog. Whether or not I think a particular e-mail or banner ad reflects good demand generation and direct marketing principles is immaterial; what matters is whether it worked. Too often, “good” campaigns fail, and others succeed in spite of themselves. With that caveat in place, here’s a recent e-mail received from Tableau Software, a Seattle-based maker of data analysis and visual analysis solutions. I have no idea whether this e-mail worked well (if someone from Tableau reads this, let us know) but it’s a rare example in recent experience of an e-mail written and designed with extremely solid principles in place. 1. Great headline. “Best Practices” is a sure seller (people always want to know how to do things better.) Using a number like “5” makes the offer seem more tangible (you know what you’re getting), and thus compelling. The sub-head “Why it will make you a better marketer” is a strong benefit statement that elicits curiosity and compels the reader to find out more. 3. Sell the offer, not the product. Only once in this e-mail does Tableau tell you what their product does, and not once do they say why you need it. The e-mail is selling information, information on how to solve a problem that (presumably) Tableau solves, just as it should. 4. Offer front and center, including a photo/illustration of the white paper. An image of your offer – yes, even if it’s just a white paper – will always make your offer more real, more tangible, and thus more responsive. 5. Simple, uncluttered design. Offer, key benefits, and call to action are all “above the fold.” Copy is spare but effective (see the key benefits represented in short bulleted points that are easy to scan.) Nothing is wasted. Every word of copy, every design element, drives the reader to one action: respond. My one criticism, and it’s a subjective one, is that the “telling great stories” theme didn’t connect with me. For all I know, Tableau may be just what our agency needs, but I don’t think of myself as being in the story-telling business. But hey, that’s just me. Overall, a campaign well worth imitating. This entry was posted in Copywriting, Creative, E-mail, lead generation, Offer Strategy, White Papers on March 21, 2008 by Howard Sewell. My creative team here at CDI points out that Tableau could have improved the e-mail further by removing the ribbon at top (the one with the logo) and decreasing the height of the photograph, all to push vital selling copy further up above the fold. It’s a good point. Just came across this post today. 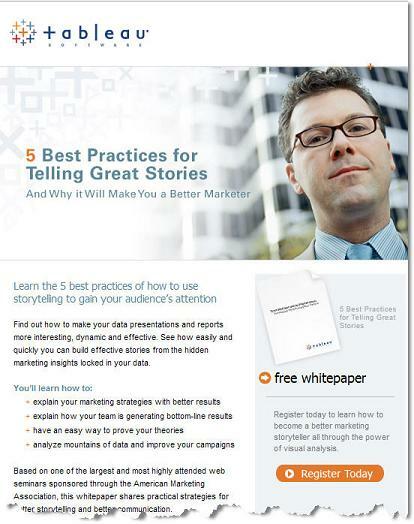 To answer the question to Tableau folks from the post – yes, this email campaign pulled very well. We sent this specific campaign to a few different groups and all performed above expectation. Fun to come across it used as a good example. Thanks! Thanks for the info, Amy. Happy to see my opinion confirmed!